Wynn Common is surrounded by Logan Hall, College Hall, Houston Hall and Irvine Auditorium on the University of Pennsylvania. The vandalism took place at the far end of this view, below the Penn Seal. Wynn Commons, a shared outdoor area on the University of Pennsylvania campus named after casino mogul and Penn alum Steve Wynn, was defaced Tuesday in the wake of sexual assault allegations against the billionaire. Last week, the Wall Street Journal published a report on the allegations against Wynn, detailing the accounts of numerous Wynn Resorts employees who say the CEO practiced a decades-long pattern of sexual harassment and coercion. Shortly after the report broke, Wynn issued a statement denying the allegations and swiftly resigned as finance chairman of the Republican National Committee, a position he had held since the inauguration of President Donald Trump. 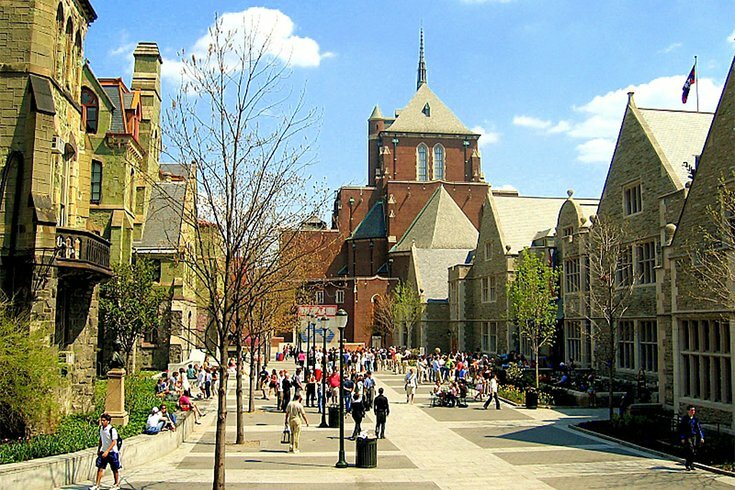 Members of the Penn community were quick to point out that the common outdoor space carried the name of an alleged sexual abuser. The Daily Pennsylvanian reported Wynn Commons was defaced Tuesday. Wynn Commons joins four other buildings of the Perelman Quadrangle through a series of staircases, ramps, and bordering walls, which also serve as seating areas. Located in the center of the campus, it serves as a space for gatherings. It includes a raised Penn Seal at the east end of the quad behind the words "Wynn Commons." Two black streaks of paint were defaced the word “Wynn.” Despite attempts to clean up the paint, signs of the marks remained, the Daily Pennsylvanian said. Since graduating from the University in 1963, Wynn reportedly donated $7.5 million to the school in 1995 and served on the Board of Trustees until 2004. As the allegations against Wynn gain attention, Penn has yet to make a public statement about Wynn amid calls by some to return his donation.